NOTICE: Activation key must be used on a valid Steam account. Requires internet connection.ABOUT THE GAMEBorn the son of a poor immigrant, Vito is a beaten down Italian American who is trying to escape the life of poverty that consumed his childhood. It was on the streets that Vito learns that joining the Mafia is the only route to wealth and respect for people of his standing. Wanting to escape t… he life of hardship that his father led, he dreams about becoming a Made Man.A petty criminal his whole life, Vito, along with his childhood friend, Joe, will descend into the world of organized crime. Together, they will work to prove themselves to the Mafia as they try to make their names on the streets. Starting with low-level jobs like robbery and stealing cars, Vito and Joe escalate quickly up the Mafia family ladder…but the life as a wise guy isn’t quite as glamorous as it seems.From the developers of the award-winning Mafia comes Mafia II, a beautifully crafted look into the dark and unforgiving world of the Mob. Expanding upon the original hit that captivated more than 2 million gamers around the world, 2K Czech takes players deeper into the Mafia with a mature and compelling narrative that will immerse players like never before.KEY FEATURESAction Packed Gameplay: White-Knuckle car chases, visceral hand to hand combat and intense gunplay – it will take all that and more to be a Made Man. Epic Gangster Story: Inspired by iconic mafi a lore, the compelling characters and cinematic presentation will pull players into the allure and impossible escape of life in the Mafia.Immersive World and Period: Enter the world of Empire Bay – World War II is raging in Europe and the architecture, cars and music and clothing all echo the period. As time passes, hot rod cars, 50's fashion and some of the era’s best music reflects the birth of a cool new time – the golden age of the American Gangster.Soundtrack Refl ects the Mood of the Era: Players will be immersed in vintage America as Mafia II features tracks from some of the 1940’s and 50's most influential artists.SYSTEM REQUIREMENTS Minimum: OS: Microsoft Windows XP (SP2 or later) / Windows Vista / Windows 7 Processor: Pentium D 3Ghz or AMD Athlon 64 X2 3600+ (Dual core) or higher RAM: 1.5 GB RAM Hard Disk Space: 8GB Video Card: nVidia GeForce 8600 / ATI HD2600 Pro or better Sound Card: 100% DirectX 9.0c compatible sound card Peripherals: Keyboard and mouse or Windows compatible gamepadRecommended: OS: Microsoft Windows XP (SP2 or later) / Windows Vista / Windows 7 Processor: 2.4 GHz Quad Core processor RAM: 2GB Hard Disk Space: 10GB Video Card: nVidia GeForce 9800 GTX / ATI Radeon HD 3870 or better Sound Card: 100% DirectX 9.0c compatible sound card Peripherals: Keyboard and mouse or Windows compatible gamepad Product offered subject to your acceptance of the 2K Games License (see in game manual and at www.take2games.com/eula) and Steam Subscriber Agreement (”SSA”). You must activate this product via the Internet by registering for a Steam account and accepting the SSA. Please see www.steampowered.com/agreement to view the SSA prior to purchase. If you do not agree with the provisions of the 2K Games License or SSA, you should not buy this game in accordance with our returns policy. Non-transferable access to special features such as exclusive, unlockable, downloadable or online content, services, or functions may require single-use serial code, additional fee and/or online account registration (13+). Access to special features may require internet connection, may not be available to all users, and may, upon 30 days notice, be terminated, modified or offered under different terms.Mafia ® © 1998-2010 Take-Two Interactive Software, Inc., and its subsidiaries. 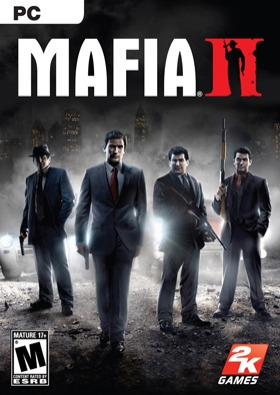 Mafia ® II developed by 2K Czech. 2K Czech, 2K Games, Mafia, Mafia II, Take-Two Interactive Software and their respective logos are all trademarks and/or registered trademarks of Take-Two Interactive Software, Inc. The ratings icon is a trademark of the Entertainment Software Association. All other marks are property of their respective owners. All rights reserved.